We were told that Hurricane Patricia was the strongest event of its kind in history. A quick look at the record books reveals that this is not true at all. Hurricanes, cyclones, and typhoons are just different names for the same weather phenomenon: intense tropical cyclones (TC). The only difference between them is their locations. In the Atlantic and Northeast Pacific, we refer to them as hurricanes. In the Northwest Pacific they are called typhoons. In the South Pacific and Indian Ocean, people call them cyclones. Since they are not physically different, it makes no sense to speak about records set for hurricanes, cyclones, or typhoons separately. Governments blow extreme weather events out of proportion to build public support for the United Nations Climate Change Conference. 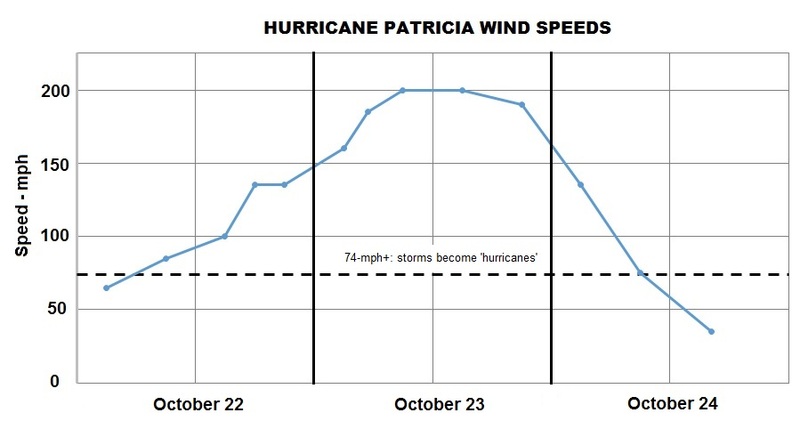 So how did Patricia compare with other severe TCs on record? The most intense TC, as defined by how low the central pressure became, was Typhoon Tip in 1979 in the Northwest Pacific Ocean. Tip reached a low of 870 millibars while Patricia never dropped below 879 millibars. The most intense TC, as defined by maximum sustained surface wind speed, was Typhoon Nancy in the Northwest Pacific Ocean in 1961. Nancy attained 215 mph. Six TCs between 1959 and 1997 exceeded 190 mph. According to The Weather Channel, Patricia’s maximum sustained wind speed at landfall was estimated at 165 mph and an automated weather observation site in Cuixmala on the west coast of Mexico reported 185 mph. 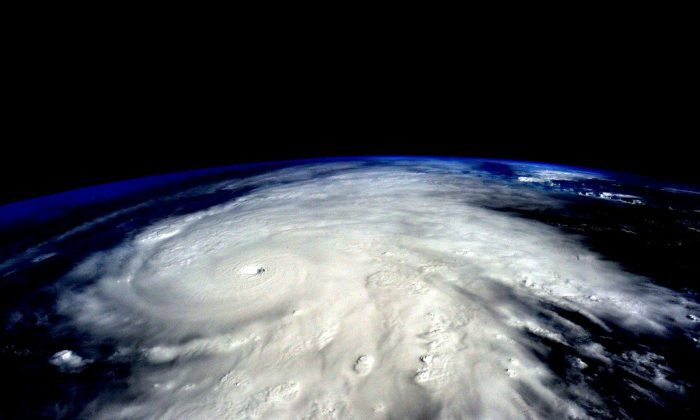 Patricia’s supposed 200 mph wind speed over the ocean was not actually measured. It was merely predicted by computer models based on the measured speeds thousands of feet above the surface. The evidence that it was exaggerated is the rapidity with which the winds supposedly diminished after the storm reached land where more accurate speeds could be determined through direct measurements at ground stations. Patricia did not even set a record for gusts. Cyclone Olivia gusted to 253 mph at Barrow Island, Australia, in 1996. Patricia gusted to 211 mph at the Cuixmala station. Claims that Patricia set records for the most rapid intensification are also wrong. While the storm did indeed strengthen quickly, supposedly dropping 100 millibars in only 24 hours, Typhoon Forrest in the Northwest Pacific in 1983 took less than a day to drop the same amount. Super Typhoon Irma in 1966 in the Northwest Pacific intensified even faster, taking only eight hours to drop 51 millibars. At about 200 miles across, Patricia was only about half the diameter of Katrina, which struck New Orleans in 2005, and a quarter the diameter of Sandy, which crippled New York City. Tip holds the record, however, as it stretched 1,380 miles across, nearly half the size of the contiguous United States. Patricia had wind speeds in excess of 74 mph, the level at which a TC is first labeled a hurricane, for about two days, only one of which was at a category 5 (the highest). Hurricane/Typhoon John in the Northeast and Northwest Pacific Basins lasted 31 days in 1994 and five TCs in the West Pacific stayed at category 5 for three and a half days or more. Storm surges, an abnormal rise in ocean level generated by storms, are often the greatest threat from TCs. The 1876 Bakergunj cyclone in Bangladesh holds the record at 44.6 feet. There have been no TC storm surges to exceed 32.8 feet (10 meters) in the 20th or 21st centuries. For example, the peak surge from Hurricane Katrina was 27.9 feet. Loss of life and property damage from TCs can be staggering. About 300,000 people perished due to the Great Bhola Cyclone in Bangladesh in 1970. The deadliest hurricane in the United States was that which hit Galveston, Texas, in 1900, killing more than 8,000. Over 6,000 Filipinos died due to Haiyan, and Katrina killed about 1,500. In contrast, the BBC reports zero deaths due to Patricia while other media sources list as many as a half dozen. The maximum damage (in 2005 U.S. dollars) caused by a TC anywhere in the world was the Great Miami Hurricane in 1926 which cost $157 billion. The Galveston Hurricane of 1900 did $99.4 billion in damages. Katrina cost at least $81 billion. The U.S. government and others regularly exaggerate the threats of extreme weather events such as Patricia for political reasons. Here are two of them. The second reason governments blow extreme weather events out of proportion is to build public support for the United Nations Climate Change Conference in Paris in December. For example, on Oct. 23, Mexico’s climate envoy Roberto Dondisch Glowinski tearfully pleaded for U.N. delegates to stop bickering as his country braced for Patricia. “I don’t think I have to say more about the urgency of getting this deal done,” he said. While it is important to help people prepare for extreme weather events, and indeed the Mexican government did a good job getting ready for Patricia, the idea that we control tropical cyclones is nonsense. Storms like this have always happened and always will no matter what we do. Dr. Tim Ball is an environmental consultant and former climatology professor at the University of Winnipeg, Canada. Tom Harris is executive director of the Ottawa, Canada-based International Climate Science Coalition. ICSC is not right wing (its participants come from across the political spectrum), is not funded by “big oil,” and there are no lobbyists or “shills” for industry of any sort. Tom Harris has never worked as a lobbyist or PR rep for any company or sector. Industry leaders must stop feeding the fires that are burning down their homes.